For a taste of authentic Greece, Villa Mary's House could be for you! Full of character and charm this 2 bedroom house has a picture perfect setting. With its private pool overlooking the sea and countryside, it's an idyllic spot. If you can tear yourself away from the villa, Fokia Bay and Pefkos resort centre are around a 20 minute walk or 5 minutes' drive. WiFi, pool heating and air conditioning/heating in all bedrooms and lounge are included. Oozing charm and character, with magnificent sea views, this is a true Greek haven. Pefkos Village is within easy reach too! Outside, the private pool takes centre stage. The shaded terrace comes with a small seating area and sun loungers - great for relaxing and making the most of the spectacular views. To the side of the house there is a further spacious terrace with a brick BBQ, games tables and outdoor table with chairs - perfect for alfresco dining. There is an impressive driveway, lined with palm trees, for your hire car. Entrance to the villa is from the driveway at the front of the house which leads directly into the lounge. With its traditional Greek furnishings, seating area, flat screen TV and patio doors leading out to the shaded terrace, the lounge is great place to unwind . An archway from the lounge needs to the kitchen/dining area - a bright and airy space that comes with all mod-cons to cater for your villa holiday. Patio doors lead out to the side terrace. 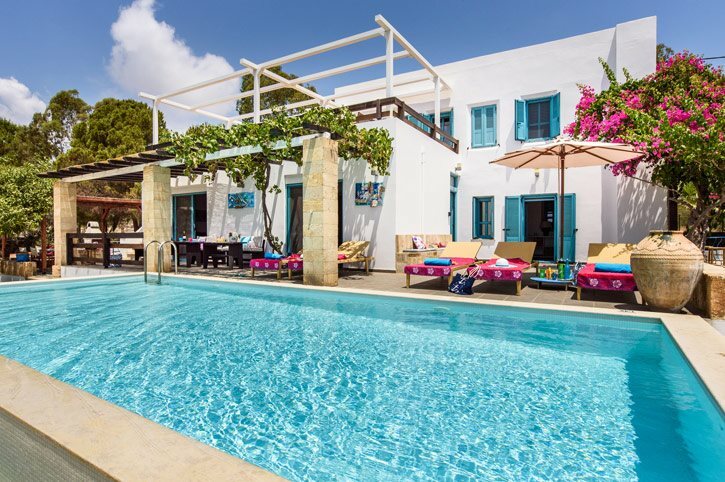 The villa comprises of 2 double bedrooms, one on the ground floor with a patio door leading to the pool area and the other upstairs, which is accessed by a traditional wooden staircase. There is also a bathroom with half bath and overhead shower on both the ground and first floor. In addition, there 2 single beds - suitable for children up to 12 years - one in the ground floor hallway and the other on the landing upstairs, with access to the first floor terrace where you can enjoy wonderful sea views. This villa is registered and licenced by EOT Greek licensing association. This number is: 1476K10000502801. Villa Mary's House is located in the popular resort of Pefkos, south of Lindos. The resort is surrounded by beautiful Greek countryside. A short walk will take you to a mini market and taverna. By taking a 20 minute walk or 5 minutes' car ride you shall reach the resort centre of Pefkos where you will find a wide selection of shops and restaurants. This charming house is ideally situated for exploring the delights Rhodes has to offer. The resort of Pefkos has a local bakery offering a wide variety of sweet and savoury treats and also a mini market. The nearest main supermarket can be found just before the village of Kalathos. Nearby Lindos is a hive of small boutique shops and craft shops, for some serious retail therapy. Or, head north to the cosmopolitan Rhodes Town where you will find designer shops and well-known high street brands. Pefkos is a popular family resort and offers a wide variety of bars and restaurants. The seafront restaurants offer the opportunity to enjoy wonderful sunsets. Bars offer entertainment including quizzes, tribute bands and rock evenings. For those of you that want to enjoy some livelier night life you can easily get a taxi to drop you into Lindos. Lee Beach is the main beach of Pefkos with sun loungers, umbrellas and boat hire. Smaller beaches of St Thomas, Kavos and Plakia are also a good choice. Fokia Bay at the far end of the resort offers scuba diving at all levels. Pefkos offers bars and restaurants with play areas for children. Water sports including pedaloes, jet skis, and boat hire can be enjoyed in Pefkos and nearby Lindos too. The glass bottom boat can be found at the end of 'Boat Trip Lane' in Pefkos offering short boat trips around the local bays - perfect for children. The monastery of Profitis Ilias is situated on the hillside up above Pefkos. At night you will see its large cross lit up. A short drive away from Mary's House is Lindos home to the famous Acropolis where you can take a 'donkey taxi' to the top and St Pauls chapel which is popular for weddings. Near to the village of Lardos you will find Hellas Mini-Golf. They have 18 standard holes of Swedish type recognised by the World Mini-Golf Federation. In Afandou Bay you can find a championship 18-hole golf course. Scuba diving is very popular at Fokia Bay. Inland from Lardos is the village of Laerma well known for Horse riding. Mary\'s House is not available to book for season as it is sold out. Take a look here at the Rhodes villas that are currently on sale. Location: Boat trip road Pefkos. Sails to Lindos daily leaving in the morning and returns to Pefkos at approximately 4pm. Sailing time 1 hour each way. All trips sail past the cliff from the movie ‘The Guns of Navarone’, the Lions Head, St Pauls Bay and Lindos Acropolis.